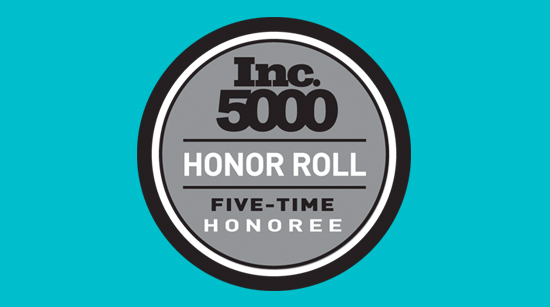 For the fifth consecutive year, Devbridge has been named to the Inc. 5000 list of fastest-growing companies in the U.S. The annual list, published in the September issue of Inc., recognizes the fastest-growing private companies in America. This year, Devbridge was named 1,324 on the list of 5,000 businesses­­. Devbridge was founded in 2008 by five individuals who desired to bring their clients a higher level of craftsmanship in building software solutions while being completely transparent throughout the entire process. Since its humble beginnings in a Chicago office basement before Chicago tech was cool, the company has seen 1,098.5 percent revenue growth over the past five years. This month, Devbridge surpassed the 300 employee mark in its offices in three countries: the United States, Canada, and Lithuania. Today, Devbridge works with the likes of Grainger, Morningstar, John Deere and other FORTUNE 1000 companies and Tier 1 banks on a wide array of digital products, from mobile banking products, to custom portals, to field service applications. Devbridge continues to be one of Chicago’s top hiring companies, with an expansion of its team by more than 50 percent in 2017 so far. Interested in career with Devbridge? The company will host "Defy Mediocrity," an open-house event at its Chicago office Sept. 21. Learn more here and reserve your spot!